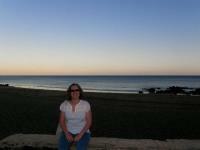 We had a lovely week in Lanzarote, which came just a day or so after our Wedding Anniversary so was partially in celebration of that. Thanks to all at Safari Diving for recommending accomodation, eateries and entertainment, organising transfers, and most importantly for all the great diving!!! 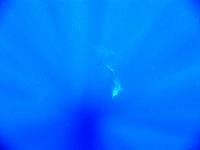 On our second dive of the trip at Richies Place, we see an Angel Shark swimming past beneath us right at the start! 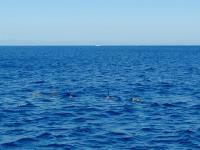 Our first proper shark sighting! 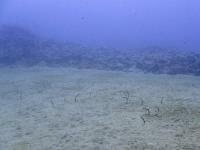 Garden eels - so called because it looks like they are growing out of the sand. A splash of colour under a dark overhang. These cheerful little chappies are Rockfish, a smaller cousin of the Scorpionfish. Careful though, their spiny fins are venomous! A cylinder anemone sticks out from a sandy bottom that is otherwise pretty barren. 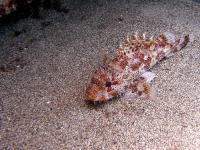 This little weever is another sand dweller, and also has venomous spines. Ruth poses as the sun sets. The cheeky Sharpnose Puffer that is swimming away tried to bite a chunk out of the Nudibranch as he swam past! Sponges in the back of a cavern called Cathedral. 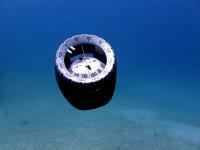 They are in tact because they are in a crevice too small for incompetent divers to get in and break them with their fins! 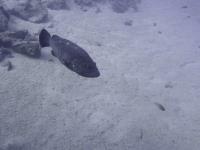 This big grouper lives at about 20m just in front of the dive centre. Apparently he is friendly and curious, but he gave us a wide berth. 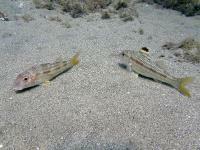 Two striped mullet scouring the bottom for morsels crossing the path of a larger red mullet. This arrowhead crab got our guide Ralf all excited - apparently the thing it is holding in its claw holds all its eggs - Ralf had never seen that before! You can tell from Ruth's hair what she is doing. Currently she is descending, so her hair is streaming out above her. 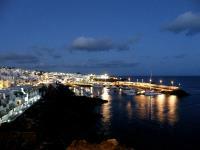 This is the view back across the old town from the seafront. Our appartment is slightly right of centre somewhere! 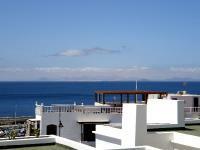 The view from our appartment across to the island of Fuertoventura. Out appartment was in a very attractive complex, even if it was surrounded by the largest concentration of Irish bars I have ever seen! Ruth using the picture menu to choose her lunch. Bless. I jumped in the water with my camera, and managed to snap these two below me! 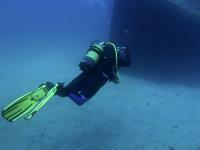 Arriving on the first of the two "new wrecks", two artificial reefs right next to each other. 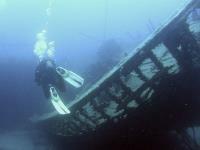 The bows of the first wreck, with bubbles from divers below getting caught on the railing. 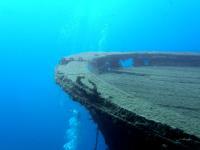 Ruth snaps a shot of the bows of the second wreck as we swim over to it. 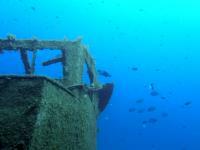 This wreck has more fish around it! The starting point of all good wrecks - the harbour! 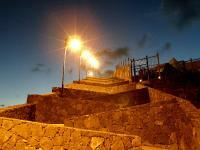 This path zig-zaqs up the a steep slope besinde the harbour, forming a wierd geometric pattern. 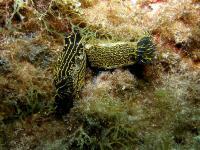 These wee sharpnose puffers are cute - their little fins move really fast even though they swim quite slowly! 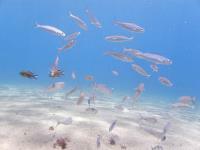 Can you spot the flounder it is cruising above? 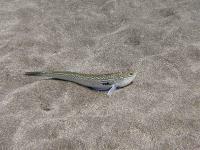 A mullet digging in the sand for food. My compass came off its mount on this dive. Fortunately it hung around! A little blue-fin damsel hiding under a rock. 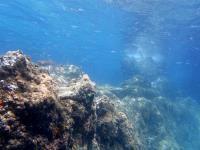 Looking up the reef from the shallows. An Atlantic Wrasse, startling emerald green. Ruth playing with some blue-fin damsels that have come out into the open. 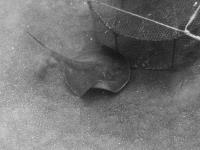 This fish trap was baited with Sardines, and this Stingray was determined to get a piece of the action! 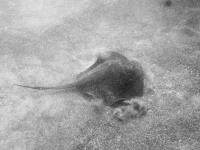 Eventually he conceded defeat and swam off across the sand. 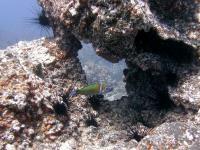 I love these brightly coloured Turkish Wrasse, and this landscape of lava and sea-urchins is really alien. 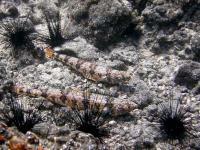 Atlantic Lizardfish lurking amongst the urchins. 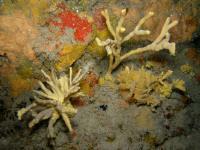 Assorted sponges, anemones and corals! A fire worm. 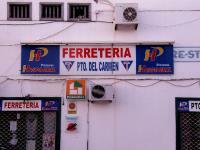 So called not because of their red-colour, but because of the firey sting they can administer! 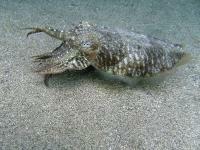 A cuttlefish. 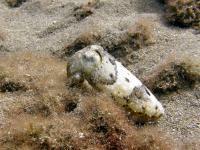 This trip was the first time we saw cuttlefish, and we found them fascinating. 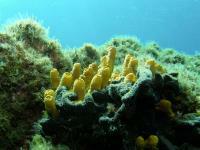 Sponges on black volcanic rock. 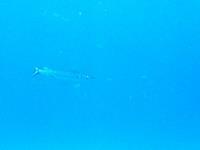 A barracuda cruising the reef, looking for his lunch. 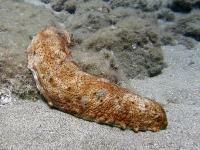 This rather repulsive animal is a sea-cucumber. Quite what resemblance it bears to a cucumber is a mystery to me. More mullet crossing paths as they forage on the sand. Can you see any camoflaged critters in this? No? 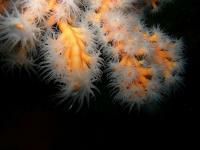 I couldn't either, but the encrusting life has fantastic colour in it! 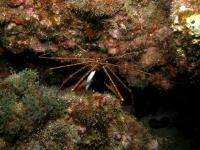 The shallow reefs are more like a garden than anything else! 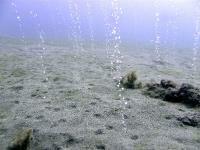 Bubbles from the sand? No, it's not flatulent burrowing creatures, this is air from divers in the Cathedral Cavern below. 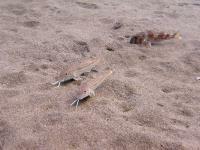 A black goby tries to cover itself in sand, but I can still see it! 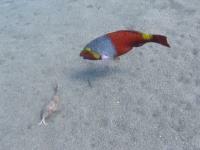 A Rusty Parrotfish cruises over a mullet. 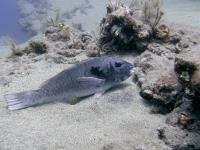 These parrotfish look black to the naked eye, it's only if you shine a light on them the colours come out. 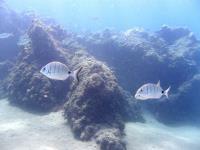 Bream are plentiful near the shallow parts of the reef. 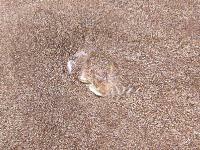 Another cuttlefish - this time buried in the sand. Our presence attracts its interest and it comes out of its hidey hole and starts displaying different textures, patterns and colours on its skin. Amazing! 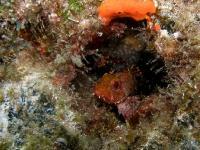 A juvenile parrotfish resting. You can tell its not asleep though, as parrotfish build a mucous bubble around themselves to sleep in! 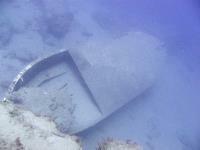 This is the little wreck on the slope in front of the dive centre (it's about 30m down). Horse mackerel are plentiful in the bay, but they need to be watchful as there are amberjack prowling around, just waiting to grab one as a tasty snack! 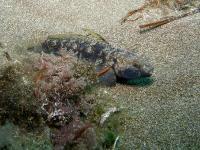 Another rockfish, this one on the sand. I love the intricate patterns on these, especially around the eyes. 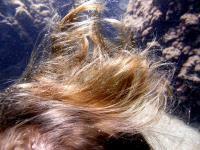 Ruth's hair traps lots of tiny bubbles underwater. 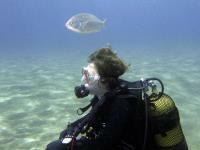 This confuses some of the fish, like this bream which had just tried to eat some of the bubbles in the hair! This rockfish has a nice hole to hide in. 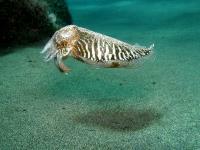 Another cuttlefish. 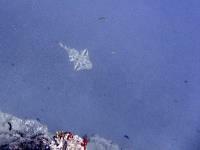 It seems interested in us and is making different shapes with its tentacles, watching how we react. 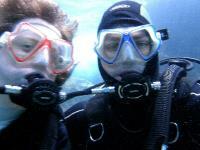 Ruth and I at the end of the last dive - see the grins? 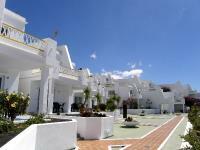 The Hotetur Aquarius Appartments where we stayed. 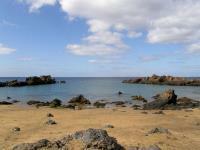 The view across the bay at the dive centre. 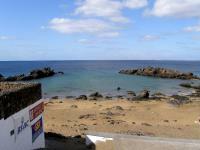 A lovely sheltered spot to enter and exit the water for local dives. The front of the dive centre. Ruth and I pose with Nico and Ralf, the two guys who were stuck guiding many of our dives. 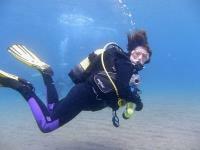 They are both great divers, and enthusiastic about the life you see when diving. We couldn't have asked for better guides. 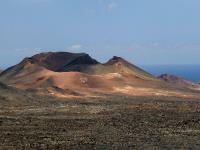 On the last day we went to Timanfaya national park in the volcanic South of the island. 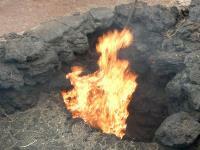 Here the ground is so hot that if you put some straw in a hole just a meter deep it will burst into flames! 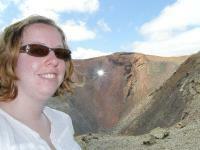 They also have some shallow boreholes which turn into geysers if you pour in a bucket of water! 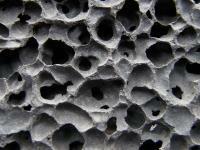 The visitor centre is built partly of blocks cut from lava floes, full of bubbles thanks to volcanic gasses. 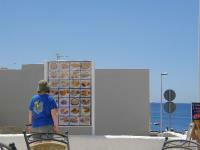 Ruth watches some canarian potatoes cooking on a volcano BBQ! The landscape is full of peculiar structures. 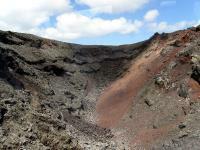 Looking up at the rim of a partially collapsed crater. 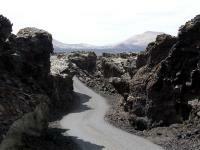 A bus took us on a tour of the landscape, the road itself cut deep in the lava in places. One of the larger cratered mounds. 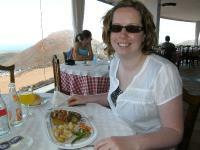 Ruth with her mixed kebab lunch - cooked by volcanic BBQ of course! 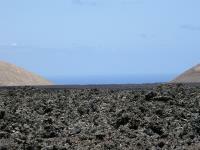 In places there are fields of set lava that stretch as far as the eye can see. Spectacular view from Mirador del Rio. Ruth poses in the sunshine and wind! Ruth poses with our rental car... Foxy! 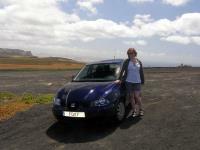 We take a look around Costa Teguise on the way to the airport, and I force Ruth to pose in the sun and wind again. 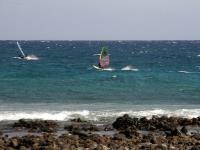 It seems to be a breezy place, but these windsurfers don't seem to mind. 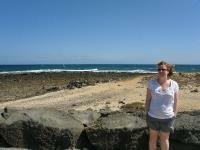 Off to the airport now - byebye Lanzarote, thanks for a fab week!